Dan Bricklin's Demo & demo-it! This is a personal web site that I maintain myself. It has historical information I've accumulated (including about VisiCalc), some of my thoughts and writings, material from others that I find of interest, and material specific to me for reporters and researchers. It has thousands of unique pictures of interest to people in the computer industry! This section lists major additions and changes to this web site. Changes to the Personal Log are not usually listed since they are so frequent. by Wiley and in bookstores now! See the Book Web Site for details about the book and companion material or buy now. This blog covers my thoughts on making web sites, the computer industry, digital photography, PC history, conferences I attend, and people I know or run into. Posted more frequently than the rest of this web site. Comments from me and others. Includes an article on "Why VisiCalc wasn't patented", popular pages like "What will people pay for? ", "The Cornucopia of the Commons: How to get volunteer labor", "Copy Protection Robs The Future", and "Installing Verizon FIOS fiber-optic Internet service to my house". Recordings of interviews, meetings, and other events. Includes Toby Redshaw of Motorola discussing their use of wikis and blogs, Vice Admiral John Morgan explaining the 1000-ship Navy, Vern Raburn giving a tour of the Eclipse Aviation factory, and much more. Historical information, including photos and a working copy, about VisiCalc, companies I've worked for, and other old stuff. Pictures from computer industry events I've attended and trips I've taken. Information about Dan's book, Bricklin on Technology, including additional material for readers. Links, book reviews, and more. My resume, photos of me, and other material for reporters. Who is Dan Bricklin? I'm best known as the co-creator of VisiCalc, the first electronic spreadsheet as we know them today, though I have made other contributions to the computer world, too. You can learn more about me by reading my biography (it's actually more of a PR backgrounder) in the Background Info section and also by looking at the History section of this web site (lots of pictures!). I currently am full-time CTO of Alpha Software. I also, on the side, continue to run a tiny company called Software Garden, Inc., through which I do consulting, speaking, and software development. Software Garden currently sells an Apple iPad app that I wrote: Note Taker HD. It also sells "A Developer's Introduction to Copyright and Open Source", a training video. 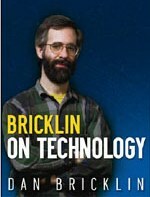 Software Garden is also known for products I produced in the past, including Dan Bricklin's® Demo Program and demo-it!. Demo and demo-it! used to be sold and supported by Programmers Paradise's Lifeboat division (www.pparadise.com). The most famous use of demo-it! that I did was a spoof of Java applets called "ChiaPaint" shown at Demo'96. A copy is in the Writings section. Bob Frankston's home page is www.frankston.com. Bob created VisiCalc with me and helps me with material on this web site. Bob, David Reed, and I usedn to contribute to a joint weblog called SATN.org. I also created most of a web site about business writing for the intranet, www.gooddocuments.com. On this site I try to follow some of the principles presented there. Some of my products were designed with the aid of Micah Zimring, a user interface designer. He also does calligraphy. My more recent products were designed with the aid of Adina Bricklin. See the Resources section for more links. This web site is maintained by Dan Bricklin. It is written using Trellix 2.0 and Trellix Web 2.7 (later sold as CuteSITE Builder). For information about how I use those products to create this web site, see "How this web site is made". Disclaimer: This is a personal web site. Investors should not rely on any statements in this web site when making investment decisions. Also, I am not a lawyer - this is not legal advice. "Dan Bricklin's" is a registered trademark of Daniel S. Bricklin. Other trademarks are the properties of their respective owners. Send comments to w e b master at bricklin dot co m.